Life can be compared to a video game, where we are all capable of 'levelling up'. In fact, levelling up is something hugely satisfying to us as human beings, and this is why it works so well in games. There is a rush of reward when we reach the next stage that is very addictive. The way we level up in real life is not by gaining experience points, but by gaining actual life experience. So, when I use the term 'level up', what I really mean is reaching the next level of learning, personal progress, happiness, love, consciousness, whatever. Do we gain new abilities when we do this? Well, we are capable of being a little more happy than before, a little more loving and fulfilled than before, a little wiser than before. You can apply this to your own life by looking at yourself in the past. Many people cringe when they see themselves from a few years before, because they have changed so much in that time. They have reached new levels of progress. Their less advanced self looks embaressing in comparison. This is evidence that you are constantly growing as a human being. However, while growth is compulsory, what you might not be aware of is the pattern or trend that this growth usually follows. I'll go into a little depth for each stage so that you can better understand. This is the stage you'll find yourself at when you've just started something new - a project, a new routine, a new habit, diet, or a new level of awareness. In this stage you feel pumped up and motivated, ready to put everything you've got into the new you. People will praise and encourage you at this point. You are often optimistic here. You can just imagine yourself mastering this new whatever. Example: I just began this blog recently, and I've been writing and uploading articles every day, sometimes two a day. I'm super excited to be sharing everything I know with you guys. I can imagine myself having 100+ articles and maybe starting to make some money too. Action to take: You're really fuelling yourself at this point. Continuing will not be an issue. Once the Honeymoon is over, you enter this stage. This is where a lot of people give up on whatever they're doing. The really passionate people will continue. At this stage you begin to feel less motivated, because whatever part of life you are working on has lost the excitement it had at first. People have gone quiet about what you're doing. You need to continue without praise or encouragement, just because you want to. You may begin to feel less optimistic, because it looks like you're not making progress. Example: The initial hype of me starting a blog has ended. I'm not getting facebook comments anymore. This blog thing doesn't seem as cool as I at first thought it would be. My pageviews have gone from a hundred to about thirty a day, and show no sign of improving soon. Action to take: Don't give up when it looks like nothing is changing! This is just a phase that will pass. Even if it looks like you're not making progress, and no one is cheering you on anymore, find the strength to continue by yourself. This stage can be known as the 'dark night of the soul'. You feel low and like you want to give up. You haven't had much praise for a long time. The plateau feels like it's been going on for so long that it's not going to end. You may even start to get pessimistic and demotivated at this point. You feel like everything has turned boring, uninspiring, like there's no point continuing. You even feel like you might be worse off than when you started. A lot of people quit here, because they think things won't improve. Example: It hasn't happened yet, but I will get to a stage with this website where there has been no feedback for a long time. I predict that I'll start to lose interest in the site. It will be tough to keep coming up with new content. I'll be making no money. My pageviews may even begin to drop. Action to take: DO NOT GIVE UP HERE. You may have heard the quote 'it's often darkest just before the dawn'. Imagine that you are an aeroplane flying upwards. You will have to go through some storms and some turbulence, before you can reach the place of sunshine and clarity above the clouds. When you feel at your lowest, that's when you know the 'level up' is coming, that's when you have to keep pushing through the resistance. It's cheesy, but there is truth in 'what doesn't kill you makes you stronger'. If you can get through the Dark Night, the rough patch, then you will break through into a new 'level' - of maturity, skill, love, whatever it may be. At this point you'll feel great. The cycle will loop and go back to the 'honeymoon' stage - so you'll be all geared up and ready to make more progress. Example: If I push through this eventual dark night with my blog, I'll reach a place where I have lots more regular readers, I'm making money and I'm full of ideas for new content. Action to take: Be aware that after the refreshing feeling of getting out of the Dark Night, your work is not done. There will be another plateau on the way. As ever, keep going. But the comforting about having this knowledge is that you know no matter how bad things may get for you, life will find a way. No matter how bad you feel now, there are good times waiting in the future. The real key to using this pattern is in knowing never to give up. Some people might stop playing an instrument, because they see the masters play and feel discouraged, since they can't see themselves improving. They don't realise that they're in the plateau. Other people have been doing something for a long time, and quit once they reach the dark night because they think that they're failing somehow. A master = someone who has been through all the mistakes and all the low moments, and kept going. Stuck in a bad stage and want to get motivated? Try these quotes. In a low place or Dark Night? This might help you out. With a new site on the way, here's my perspective in hindsight... Maybe it does work like this; at least this is one way of looking at it that could be useful. 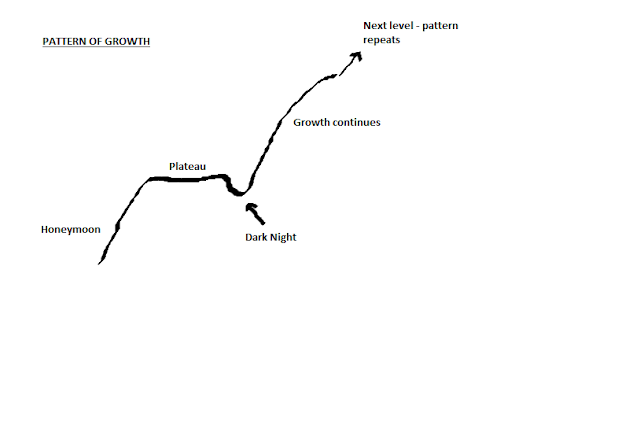 But does growth always follow a pattern? Not necessarily.